Jadeja came in to replace Hardik after the latter injured his back. Amabti Rayudu may have solved India’s no.4 conundrum, but captain Virat Kohli has fresh selection headaches in the middle order. A few weeks ago, his fast bowling all-rounder Hardik Pandya was stretchered off the field after he collapsed onto the pitch with an acute back injury, during an India-Pakistan encounter in the Asia Cup. Ravindra Jadeja was handed the responsibility to replace Hardik, and he did a lot more on his return to ODI cricket. 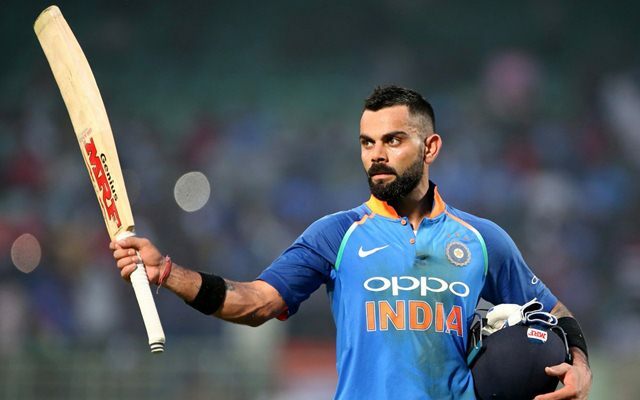 India’s management will constantly have the World Cup XI on their heads, and the next 10 ODIs or so will give them the leeway to top and tail their best playing combination. The Men in Blue have just emerged victorious in yet another home series against the Windies after routing them in the fifth and final one-dayer at Thiruvananthapuram. However, barring the top order which looks absolutely set, Kohli has made a number of changes to his side over the last five ODIs. Perhaps somewhere even he feels that he’s yet to come across that perfect combination. But the fact that Kohli can rely on Jadeja at the moment comes as a huge relief for him and his side. Speaking about the return of Ravindra Jadeja in the playing XI, the Indian captain lauded his efforts, saying the Saurashtra left-hander had done well since the Asia Cup. “It depends. When Hardik (Pandya) is fit and fine to play, you have to see what is the combination you have to take in the World Cup,” he said when asked about his chances of making the World Cup XI as an all-rounder. India also have the services of Kedar Jadhav, who can not only get some quick runs lower down the order but also has a strange knack of picking up wickets every time he has the ball in hand. Hardik is currently on the road to recovery, and his inclusion in the side could give Kohli four seaming options. “In the Test matches as well, I think he batted and bowled very well. I get a sense that he understands his game much better. He has obviously gone back and worked quite a bit, especially in white ball to come back and perform like this. He has been smart about what he wants to do with the field. In the field, there has been no question about his ability. With the bat and ball he has matured a lot now and brings balance to any side,” Virat added about Jadeja as per reports in New Indian Express. India’s next assignment is a set of 3 T20Is against the Windies which get underway at the Eden Gardens on November 4. They will then travel Down Under for a lengthy all-format series against the Australians, their last overseas tour this year.